Darren Hardy is an American author, keynote speaker, advisor, and former publisher of SUCCESS magazine. Hardy is a New York Times best-selling author, who wrote The Entrepreneur Roller Coaster, Living Your Best Year Ever and The Compound Effect. 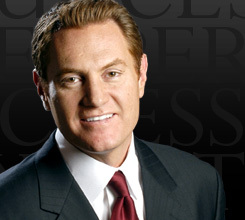 Darren Hardy was this week's guest on Success Profiles Radio. He is the publisher of SUCCESS magazine, and the author of "The Compound Effect", and his newest book "The Entrepreneur Roller Coaster". He made his first 6 figure income at 19, and became a millionaire at 24. We discussed what it takes to be a successful entrepreneur and what differentiates high achievers from everyone else. We also talked about how successful people deal with self-limiting beliefs and how they view adversity as opportunities instead of wounds that need to be healed. We also talked about how to sell successfully and how to know when to outsource tasks in our business. In addition, we discussed the concept of having 20 seconds of insane courage to help us overcome that things we tend to fear. Finally, we talked about how to be insanely productive without losing your mind. We covered so much more, so listen all the way to the end because Darren offered a free giveaway for everyone.